Sorry for the poor quality, my cheap ancient digital camera had many settings wrong apparently. The technology has been introduced many decades ago, the Soviet BTR-152 APC and ZIL-157 light lorry were as far as I know the first examples of quantity production vehicles with CTIS (compare this study). The BTR-152 likely had it in order to achieve similar offroad-performance as halftracks during WW2, at least in Central Europe. P.S. 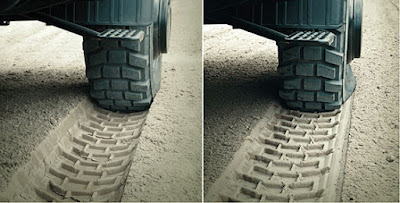 : No comments on this topic because I'm tired of "tracks vs. wheels" debates. "The U.S. Army’s War Over Russia"
Dipl.-Ing. Rolf Hilmes: Überflüssig oder unverzichtbar? Zur Zukunft des Kampfpanzers - .